Hello fellow lovers of the internet. 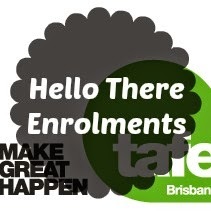 Today is a pretty freaking awesome day as in my glorious email inbox I received the long awaited Enrolment Package from Tafe Brisbane. That's right, I got into a course at Tafe Brisbane as of yesterday morning. I'm going to be studying a Diploma of Nursing at Southbank Tafe campus! And not only am I going there, three people I know are going to Southbank Tafe with me. Two are people I went through preschool and highschool with and the other is one that reads my blog constantly and makes fun of me at work. He's an alright guy. The rest of my life is finally shaping up and now I have an awesome future ahead. For the next 18 months I shall be attending this Tafe and I'm going to try make it the most amazing next few months ever. After completing my diploma I'm going to have 6 months left and in that 6 months I'll hopefully be able to find a job as an Enrolled Nurse, work there and at my current job for that time and then after my brother graduates, I will be taking him somewhere overseas instead of him going to schoolies. Not only is the year looking better by the minute, I can sort of say what I'm going to be doing for the next two years of my life.